Soulveda: Could you tell us about your collaboration? How did it come to be? Sujata: We met at an art gallery in Bangalore in 2012 and discussed our professions. When Gayathri told me about her interdisciplinary approach to dance and wellbeing, I was immediately hooked. It took us three years to get the concept going, with our life events taking up our time and Gayathri working in Manchester. But when she visited India in December 2016, she had planned to stay for two months. That’s when we put the plan into action and presented BÄndhavam, our work-in-progress. Gayathri: Sujata and I were very much in sync, right from the moment we met. That had a huge role in making this work. Together, we wanted to educate the audience to look beyond the aesthetics of our art forms and perceive it as an interactive experience for general wellbeing. So, BÄndhavam is our collaborative effort to explore the synergy between music and movement, creating a holistic experience. Soulveda: Interactive experience is quite prevalent in modern day play-theatre. But an interactive dance-theatre is intriguing. Could you tell us more about it? Sujata: When we performed BÄndhavam in January 2016, we weren’t entirely sure of the performance format. We refrained from calling it a workshop because we didn’t want non-dancers to be discouraged from attending our programme. Instead, we presented our work as a performance and threw the floor open for discussion afterwards. Gayathri: There was also a part in the presentation where I pulled out a member from the audience to join me in dancing. She’s my friend and a dancer, but she wasn’t expecting it. She played along well though. Soulveda: That must have been exciting. What was the audience response to this? Gayathri: Frankly, I was quite doubtful about the audience response to something so offbeat. But then, a woman came up to us and expressed, with tears in her eyes, how our presentation moved her. The lyrics of the Tamil song Asai Mugam had brought back fond memories of her husband. Sujata: We didn’t use costumes or music accompaniments. It was just Gayathri, her guru Meera Vishwanathan and me. We didn’t find the need for anything other than the songs, the movements, and the rhythm. When Gayathri and I were rehearsing, we were always in awe at our peaceful state of mind. We wanted to radiate that feel-good state to our audience. But we had no idea it would be received just as emotionally. Soulveda: True. Art can take us on a journey inwards. According to you, what aspect of your presentation does this? Sujata: Any art form nudges us to feel deeply. We wanted people to let go and be in the moment, rather than try to interpret the meaning or appreciate the art form for its aesthetics. I believe it was a combination of our choice of emotional songs and the intimate setting that did it. A line of the Asai Mugam song, goes Oayvu mozhidhalum illaamalavan uravai ninaithirukkum ullam. It means without any interval, my heart thinks about my relationship with him. The woman who was in tears, in memory of her husband, could relate to this. Not only because the lyrics were powerful, but also because we kept the presentation very interactive. Such an open setting creates warmth. Soulveda: What inspired you to look at wellbeing and art forms together? Gayathri: Arts and psychology go hand-in-hand. Exploring art through the lens of psychology gave me a multi-dimensional view. When I used to teach Bharatanatyam in India, my students’ parents often told me how the dance classes helped their children improve their handwriting and concentration. This made me question the correlation between transferable fine motor skills (like mudras) and basic cognitive abilities like attention, visual memory and concentration. I found that with good coordination of such abilities, comes a sense of wellbeing. So, naturally, wellbeing is at the heart of our collaboration. Soulveda: Indian classical art forms naturally embody devotion. When we speak of devotion, spirituality is not very far. How do spirituality and wellbeing connect for you? Gayathri: For me, dance is a medium that gives immense happiness. It’s my prayer. It creates positivity, which I believe is infectious. The more engaged people can get with my work, more happiness I can spread. So, I would say my sense of spirituality runs parallel to the sense of wellbeing my audience feels. Sujata: I’m a devotional singer; spirituality is a given. However, like Gayathri said, I’ve found that it’s more satisfying when an audience can relate to it. For me, spirituality is about being peaceful. This, in turn, nourishes wellbeing, for both the artiste/s and the audience. Soulveda: BÄndhavam isn’t a one-off performance for the two of you. It’s an evolving process. Do you see this holistic approach to your work turning into a wellbeing/therapeutic practice down the line? Gayathri: Arts for mental health is not only a personal drive for me, but also a professional initiative. I am in talks with cultural centres in Manchester. They wish to promote South Asian art and look forward to concepts like this. We’re doing our best to give more shape to our collaboration. Sujata: We’ve been adapting traditional art forms to get the audience to look beyond aesthetics and think about mind, body, and soul. Hopefully, with more exposure, we’ll be able to come up with a workshop format too. That way, our efforts may yield a therapeutic practice at some point. Dr Gayathri Ganapathy is a Bharatnatyam dancer and a psychologist. 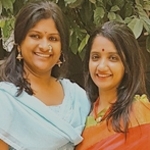 She runs Equilibrium Dance and Arts, a Manchester-based social enterprise dedicated to dance, arts, mental wellbeing and dance-science research.Sujata Iyer is a communications specialist and an Indian classical singer. She's also the brain behind Kalaalayam, a programme that explores artistes' engagement with their work.